The league honors servicemen and women on the 99th anniversary of Armistice Day as the last two undefeated teams fall. The Westfield W-League and the partnered Hyundai A-League both celebrated Remembrance Round in honor of the 99th anniversary of the end of World War 1. Throughout the weekend's four W-League games there were ceremonies and recognitions of the men and women who lost their lives and currently serve for Australia and around the world. On the pitch, the last two undefeated teams were taken down on the road leaving the league ladder more congested than ever. This is the first time since the inaugural season in 2008 that every team in the league has recorded a loss in the first three weekends of the season. There were an incredible 17 goals scored over the four games this weekend with seven of them being scored by Americans. The undefeated Perth Glory traveled to face Adelaide United without their star forward Samantha Kerr in the first game of the weekend. Kerr, who had scored in each of the first two games for Perth, was held out due to a knee injury. In her absence, Adelaide midfielder Makenzy Doniak (North Carolina Courage) scored a hat-trick in the second game of the season with her new team. Doniak has now scored four goals in two games for Adelaide and played a huge part in helping the team get their first win of the 2017/18 season. The first goal for Doniak came just four minutes into the game after she passed the ball into the middle of the box for forward Adriana Jones. Jones misplayed the ball but passed it back to Doniak who slipped it past Perth goalkeeper Melissa Maizels. Doniak was back on offense in the 31st minute when she got in behind the defense and slotted the ball on the ground to the far post and beat the keeper again. 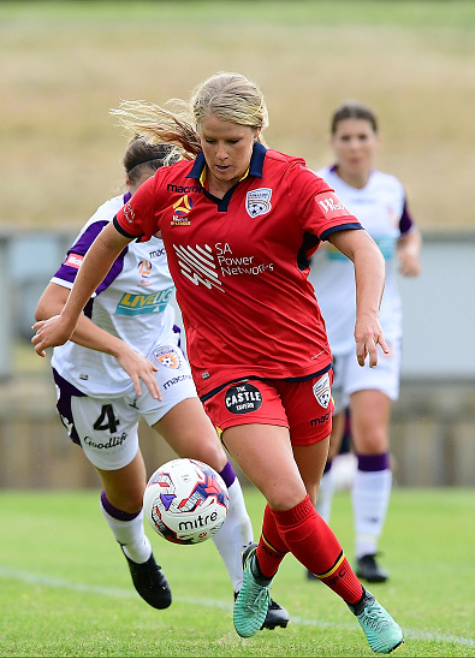 It looked like the Glory might get back into the game after halftime when Adelaide defender Emma Checker made an errant clear from the top of the box and scored an own goal against the home team in the 50th minute bringing the score to 2-1. The cross was sent into the box by Perth forward Rachel Hill (Orlando Pride), and the captain of Adelaide couldn't get a solid clear with her left foot. That hope would fade in the 74th minute when Makenzy Doniak would take control of a poor cross at the top of the box and slam the ball into the right side netting with a beautiful left-footed shot. As the game was coming to a close, Doniak would try to get Adelaide their fourth goal of the game when she played a perfect cross into the box, but the forward couldn't control the ball and it bounced safely into the arms of the Perth keeper. The 1-0-1 Adelaide side will travel to Brisbane next weekend while the 2-0-1 Glory will host Melbourne Victory Women. Rachel Hill remains at the top of the league scoring table with five goals in three games, but Doniak is closing in on her with four goals in two. The Brisbane Roar improved to 2-0-1 thanks to a pristine redirection by defender Carson Pickett (Seattle Reign FC) in the 30th minute off a free kick taken from about 40 yards out. The game was mostly wide open with Brisbane goalkeeper Mackenzie Arnold and Western Sydney Wanderers goalkeeper Jada Mathyssen-Whyman working hard to keep the ball out of their respective nets. Games in the Western Sydney stadium are neither broadcast nor commentated, so there is no other information about the rest of the match. Next weekend the 1-0-2 Western Sydney Wanderers will be on bye as they sit next to last on the ladder while the Brisbane Roar will host the Adelaide United Women. Brisbane is one of the four teams that are tied at 2-0-1. 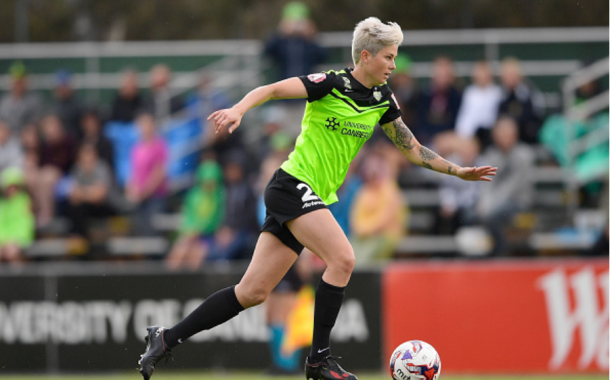 Canberra United forward Michelle Heyman, who plays for the Australian Women's National Team and formerly played for the Western New York Flash, scored a brace to help propel her team to victory over Sydney FC. Heyman got the scoring started in the 13th minute when she hit the center of the net off an assist by Bethany Gordon. Sydney FC was able to tie up the game in first-half added time when Caitlin Cooper beat goalkeeper Haley Kopmeyer (Seattle Reign) on a penalty kick. In the 70th minute, Sydney midfielder Kylie Ledbrook scored FC's second penalty of the game, but Canberra defender Toni Pressley (Orlando Pride) was able to knock a ball in for United from inside the 6-yard box just eight minutes later. With the game tied 2-2, Heyman came back for one more goal from the center of the box in the 85th minute. The 3-2 victory brought Canberra to 1-0-1 on the season while Sydney dropped to 0-0-3 and remained at the bottom of the ladder. Canberra will travel to Newcastle to face the Jets next weekend while Sydney FC will look for their first win at home against Melbourne City FC. Melbourne City FC ends the Newcastle Jets' undefeated season as they cruised to a 5-2 victory on Sunday evening. The loss by the Jets means that no team in the league remains undefeated after just three rounds of competition. 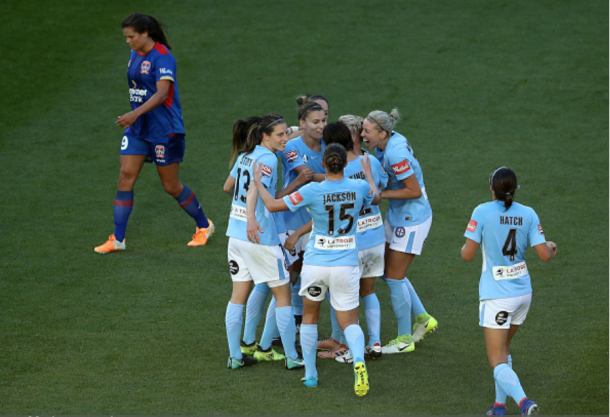 Kyah Simon got the scoring started in the fifth minute for Melbourne City FC when Newcastle defender Nicola Orgill was unable to clear the ball from inside the box. Melbourne goalkeeper Lydia Williams (Houston Dash) gave a goal away to Katie Stengel (Boston Breakers) when she took possession of the ball near the top of the box and slipped when she was challenged. Stengel easily finished the ball against an open net in the 16th minute. It only took four more minutes for another defensive disaster to befall City to Stengel's benefit when defender Alanna Kennedy (Orlando Pride) couldn't keep possession of the ball allowing Stengel a free run at goal. In the 45th minute, a Newcastle defensive mistake of their own would allow Larissa Clummer beat Newcastle goalkeeper Hannah Brewer from inside the box. The game would go to the half tied at two apiece. The second half was all Melbourne as Jess Fishlock (Seattle Reign) would score off a Steph Catley (Orlando Pride) cross in the 50th minute, Ashley Hatch (North Carolina Courage) would hit the crossbar which allowed Crummer to score her second goal of the game in the 71st minute, and then Fishlock closed out the scoring with a beautiful strike from about 30 yards out. The braces by Crummer and Fishlock were each their first goals of the season. The victory brings Melbourne City at 2-0-1 into second place in the standings while the 2-0-1 Newcastle Jets fall to third. Newcastle will host Canberra United next weekend while Melbourne will be on the road to face the winless Sydney FC squad.